Thighs, which are full of meat, juicy and succulent, are perhaps the best part of a chicken. If cooked properly, the moist meat absorbs maximum flavor and taste fabulously. 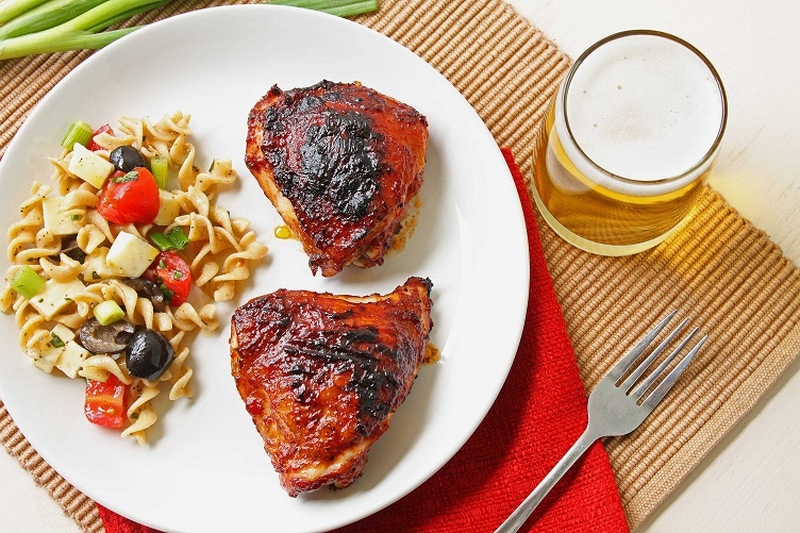 BBQ chicken thigh is the most favorite kind of chicken in parties and gatherings, and one can never love the taste. Here are a couple of recipes for you to enjoy! In a bowl, mix half cup of olive oil, crushed red peppers, zest and lemon juice and the chopped herbs completely. Rub the marinade onto the chicken thighs. For better distribution, layer the thighs in a single row in a flat tray and leave the chicken to marinate over night. You can also leave the marinade outside the refrigerator for an hour if you are short on time. Remove the excess herbs from the chicken and drizzle with some fresh olive oil. Also, cut two lemons to grill along with the chicken. Preheat the oven and start cooking the chicken thighs with the skin side down. Cook each side for about 4 to 5 minutes, which depends on how thick the meat is. Once the meat is done, turn down the grill and leave to rest. Serve the chicken thighs hot and fresh. In a bowl, combine the honey, soya sauce and garlic. Set the marinade aside and preheat the charcoal grill oven. Start cooking the chicken on one side and turn over to cook the other side, and brush it with the honey glaze only at this time. Cook the chicken completely and enjoy the sticky barbeque chicken. In a saucepan, add all the ingredients expect the chicken thigh, boil and then simmer for ten minutes. Season the chicken thigh pieces and cook for approximately eight minutes on each side, starting with the skin side. Brush the chicken thigh with sauce and cook for an additional ten minutes. Enjoy the succulent chicken thighs.